Smudge was a birthday gift from my daughter in 2002. He was 8 weeks old and jumped in my purse at the pet store. All I could say was, "Oh, yeah... he's a keeper!" A week later, I found out my husband had terminal cancer. Smudge was my happy through that rough year. He grew into a loving, funny character of a cat. He was shy around men. My new husband worked with him for 2 years to show him he liked and loved him. They had their own bond, my husband mourns too. Everyone who we showed him to was enchanted by him. He was sooo soft and gorgeous. 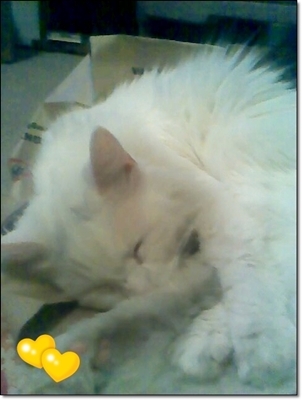 He was a Turkish Van. Fleas almost took him from us twice... luckily our vet saved him twice. God bless our vet and his staff. Yet when FIP overtook him at age 12, we knew every day he was with us, it was a gift. Even though we chose to have him put to sleep, it was in his best interest. Because we loved him, we couldn't watch him suffer anymore. We cry because we miss you Smudge. I'll always love you Smudge. No cat will ever replace you. So sorry for your loss of Smudge, he was a special kitty. Forever in your heart and life for a reason. I am so sorry for your loss. My Casper is 13 yrs. old. 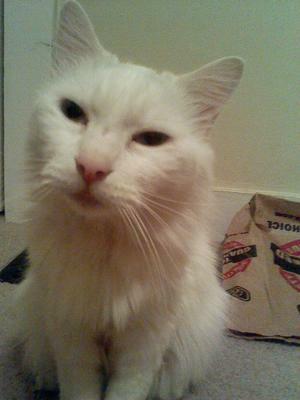 He is a Turkish Van, too, and looks exactly like your Smudge - even his face. He, too, is very sociable and likes people. He used to be very playful and funny. He has been ill with an infection for some time. Now he is healed. But he still isn't his usual self. Smudge is now a beautiful angel kitty. RIP I am so very sorry... God Bless..
by: Shadow and Bandit..from Georgia. RIP Smudge. We didn't know you, but you were a very pretty kitty. We hope you are playing in the Rainbows. Rest In Peace sweet Smudge!! I know your family will miss you but you are now pain free and running free over the bridge! !